Q-Connect Laser Copier Over Head Projection Film (Pack of 50) KF00533 Pack of 1 Transparent film for professional over head projections. 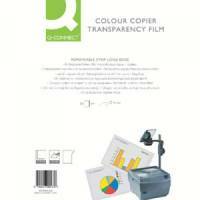 A selection of OHP film to suit all requirements. Perfect for presentations. Can be used with your laser printer. Can be printed in colour or black and white. Value alternative to bigger brands.